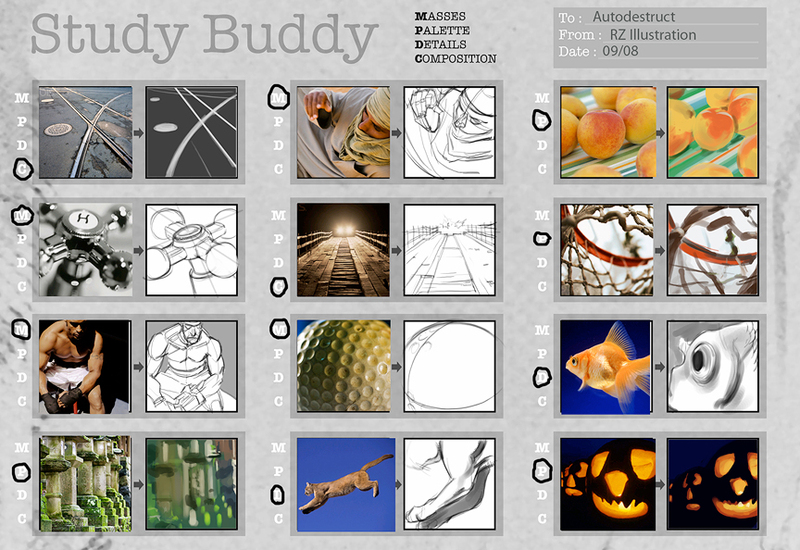 autodestruct : digital: Be my study buddy! 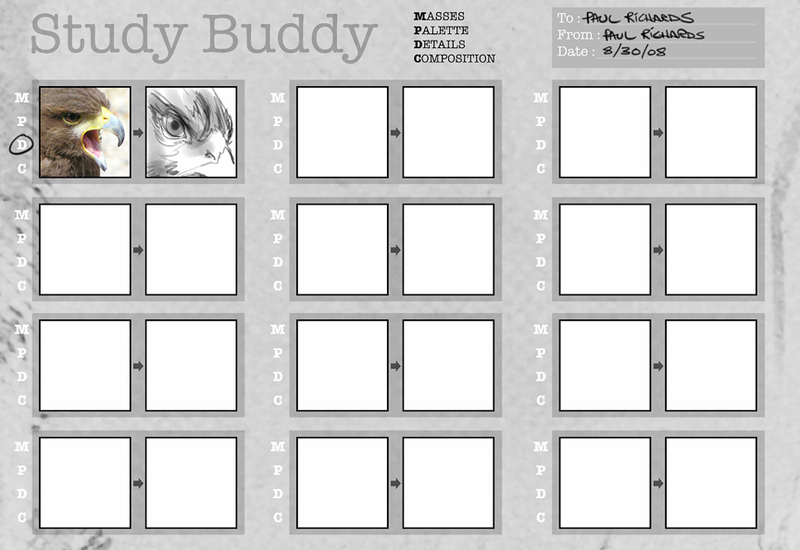 I propose an exercise : Each week (or possibly multiple times per week) I'll pair up with an artist and we'll prepare Study Buddy templates for each other [below]. It's easy! 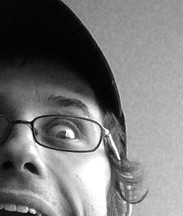 Just paste web ref (illustrations, photos, etc. -- subject matter may be thematic or random) into the appropriate boxes and circle an area of study for each (masses, palette, details or composition). Then swap templates via email. The idea is to do quick observational warmups (I would think no more than 5-10 minutes per), then post them up on your blog to share with your buddy. 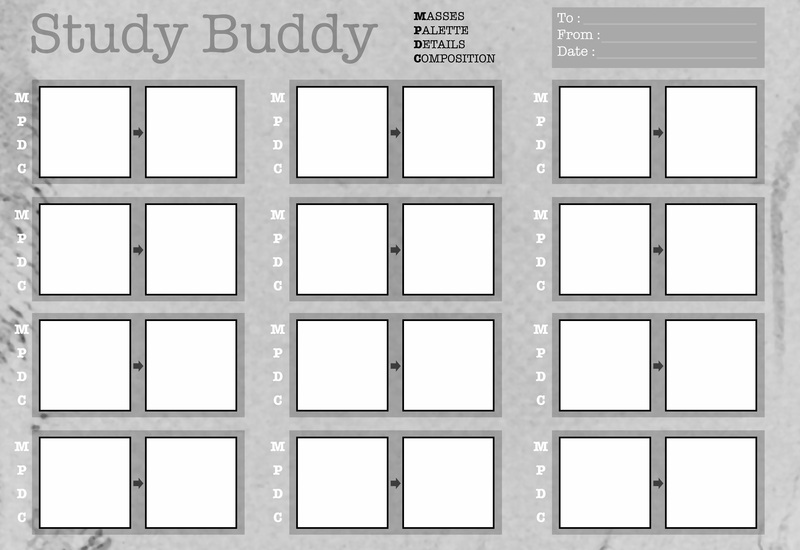 Download the Master template to conduct your own Study Buddy exercises with others! I'm hoping that by seeding this template the practice will spread virally and we'll all get a little more astute. ...and here's the one Becky made for me. Already I can tell this will be challenging. Let's hope it catches on! Lord knows, I need the excuse to do more of these. I figure if someone goes to the trouble of prepping a file for you, you kind of owe it to them to "complete" it. Puts a little pressure behind it, while keeping things wholly unexpected.